Two weeks before the start of the Tour de France, Christian Vande Velde got a confidence booster on yesterday’s final mountain stage of the Tour de Suisse. The Garmin-Cervélo rider was one of seventeen riders who went clear on the first category climb of the Flüelapass, and fought it out for a podium place on the final climb up to the line. Vande Velde eventually picked up fourth place, 51 seconds behind the winning time of Thomas De Gendt (Vacansoleil DCM), who had seized his chance inside the final 25 kilometres. Double Tour de France runner-up Andy Schleck (Leopard Trek) was second, 35 seconds back, with Vande Velde yielding just 16 seconds to him. “I’m happy with my build up here at the Tour de Suisse,” he said. “Today was not planned by any means but I was happy to be amongst it. It showed me what I still need to work on and that I am not that far off of where I need to be.” He was sitting 20th overall going into today’s penultimate stage. 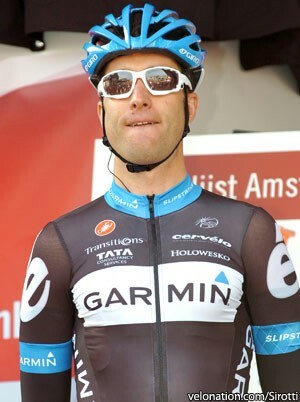 The Chicago rider is best known for his fourth place in the 2008 Tour de France. He returned the following year and was eighth, despite fracturing several bones in that year’s Giro d’Italia. He was once again one of the Garmin team’s key riders in last year’s race, but unfortunately crashed out on the stage two to Spa. Vande Velde’s disappointment was such that he considered retirement, but got his morale back and rode the Vuelta a España in order to build up for 2011. Working hard since the start of the year, he showed that his form was on the up when he finished fourth overall in the recent Tour of California. Yesterday’s fourth place in Switzerland will be further encouragement to him, and he’ll hope to once again fight for a high placing in cycling’s biggest event. Vande Velde is likely to share leadership with Ryder Hesjedal in this year’s race. The Canadian placed seventh overall last year, raising his game after his team-mate crashed out.